Good morning! Wearing a lovely (and washable!) silk kimono from the ladies at KIM + ONO, a handcrafted kimono company specializing in silk and charmeuse botanical print kimonos. Each one features an original pattern first sketched by hand, then saturated in rich watercolors using a traditional paint brush. The result? This lovely robe that I’ll be throwing over jeans to wear out, or at home to relax. So feminine and luxurious. These neutral colors are my favorite (no surprise there), but I also love this deep teal version here. 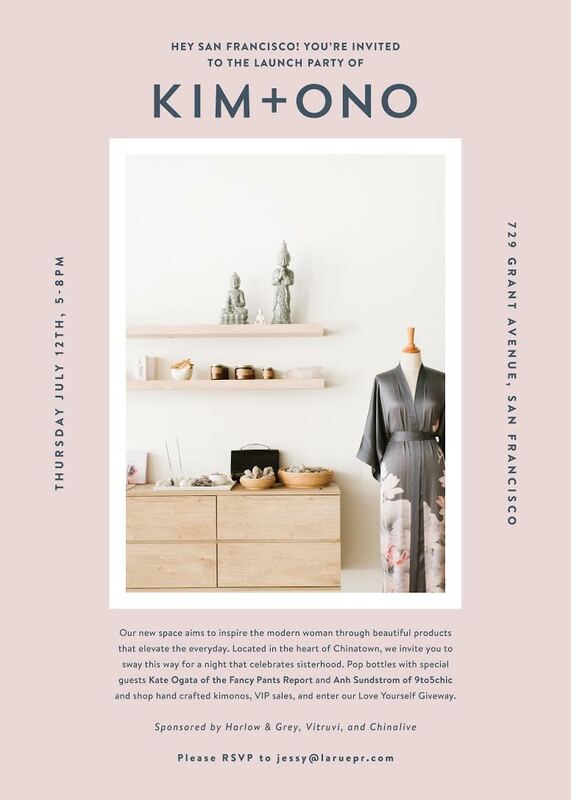 SF friends – so excited to share that I’ll be at the launch party for KIM + ONO in Chinatown this Thursday (tomorrow!) which goes from 6pm-8pm. There will be a 20% storewide sale and a huge giveaway. Details below. Hope to see you there! That kimono is beautiful!! If only I lived closer, I would have loved to attend the event! Your kimono looks perfect and wonderful elegant! Beautiful kimono look … love ♥️it! ???? Beautiful and very elegant kimono to complete this casual look! The kimono is so beautiful! Love this pretty kimono so much! <3 🙂 It's so feminine! I love how it's so colorful, but at the same time, subtle! You look so beautiful and your kimino is stunning. I’m in love with it! What a beautiful kimono. Love the pattern!